How do I connect the Razer Kraken Tournament Edition headset and the USB Controller to my PC? How do I clean my Razer Kraken Tournament Edition headset? We cannot say with certainty what type of dirt and debris may be on your product, or how certain cleaning products may react with it, but we have had good luck cleaning Razer products using commonly available monitor cleaning wipes. To clean the body of your Razer headset please take a monitor wipe and use gentle wiping motions. Do not scrub the surface of your Razer headset. When cleaning the earpads on your headset, take extra care to not get any liquids inside the earcup and onto the speaker itself, as this may damage your headset. My Kraken TE has no audio output in game or has no effect on THX/Surround configurations. Ensure "Kraken TE-Game" is set as default device in Sound Properties -> Playback as per below steps. Launch Synapse and select the headset from the dashboard. Navigate to "Sound" tab and click on "Open Windows Sound Properties"
Right click on "Kraken TE-Game" and select "Set as Default Device". Check that Game/Chat balance on USB dongle hardware is set to mid. How do I enable or disable the THX Spatial on my Razer Kraken Tournament Edition headset? 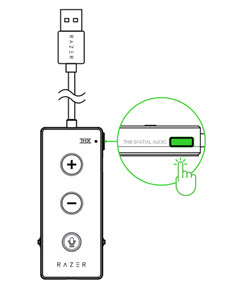 You can simply toggle the THX button on the side of the USB Audio Controller (as shown below), or adjust it in Razer Synapse 3. How does THX Spatial work? THX Spatial goes beyond traditional virtual surround sound. With integrated content, THX Spatial Audio breaks the boundaries of standard 5.1 and 7.1 channel surround to deliver seamless 360° positional audio for more natural and lifelike positioning. It adds depth to the experience by simulating sound both above and beneath you. I lost my USB Audio controller, will my Razer Kraken Tournament Edition headset still work? I lost my USB Audio controller, can I buy a replacement one? If so, where can I buy it? 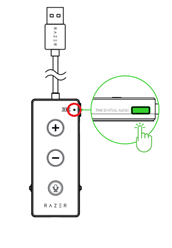 In the event that you lose the USB Audio Controller for the Razer Kraken Tournament Edition, you may purchase a replacement controller at http://www.razerzone.com/store/gaming-accessories. What is the difference between THX Spatial, Virtual Surround, and True Surround? - This is the newest technology geared towards providing an experience that goes beyond traditional surround sound by adding depth to the sound experience by simulating sound both above and beneath you. Delivering seamless 360° positional audio for a more natural and lifelike positioning. - This uses an older technology that Razer uses to simulate 7 sound channels with 2 physical speakers drivers (1 on each ear cup). - This technology produces true surround sound by having multiple speaker drivers (5 on each ear cup) to produce a sound similar to home theatre systems and large surround speakers. My Razer Kraken Tournament Edition has no sound after I plug in the USB audio controller. It was working fine when I was using just the 3.5mm audio jack. What should I do? Ensure that the "Razer Kraken TE" is your default device. Connect the Razer Kraken TE to your PC. Right-click the sound icon on the system tray and select Sounds. On the “Playback” tab, select “Razer Kraken Tournament Edition – Game” from the list and set it as the “Default Device”. Game/Chat balance adjustment may be necessary, depending on the current setting. If there is still no sound after setting the “Kraken Tournament Edition – Game” as “Default Device”, try rotating the Game/Chat balance wheel towards the “Game” side until audio is heard. How do I know if THX Spatial is turned on when I am using the Razer Kraken Tournament Edition headset? Please view the LED on the top right-hand corner of the USB Audio Controller (circled below). If it is lit, THX Spatial is turned on. Is the Razer Kraken Tournament Edition headset supported in Razer Synapse 3? What are the features supported in Synapse? Yes, it is supported in Synapse 3.0. Specifically, it will detect the USB Dongle that comes with the Kraken Tournament Edition. Can I use the Razer Kraken Tournament Edition headset's Audio controller with other 3.5mm headsets and still get Spatial Audio? You absolutely can. While the soundstage is optimized for the Kraken Tournament Edition, THX Spatial and the many audio enhancements will also improve the sound experience on any other 3.5mm headset. What are the Technical Specifications of the Razer Kraken Tournament Edition? Is the Razer Kraken Tournament Edition cross-platform compatible? 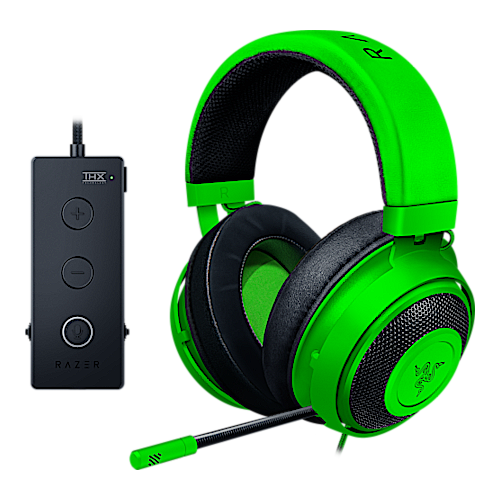 Yes, it is compatible through the 3.5mm audio jack, the Razer Kraken Tournament Edition can be used for stereo sound with consoles and any other devices housing a 3.5mm audio jack. My voice is not heard when making a call using my Razer Kraken Tournament Edition.